We can make a real difference to the impact of our comms by working to a creative communications strategy. The thing about being involved in your organisation’s strategy is, it’s all so serious, and the results can often feel conventional and just STANDARD. But we are creative comms people, and ‘typical’ just won’t cut it. Something just like every other strategy in your sector is not going to help you stand out and achieve greatness. In my experience in helping people design communications and social media strategies, teams can feel daunted by the job they have to do. Then they resort to corporate cliches and old taglines when they discuss the organisation’s mission. So, if you’re involved in a communications strategy, or any business strategy – here are three tips for making it more creative. Most strategising starts with a SWOT analysis where you outline current strengths, weaknesses, opportunities and threats. One thing I tried recently was to reimagine SWOT so the group was able to think a little differently. So instead of SWOT, we did a SKAB analysis. Superpowers – what are we heroic at doing? Kryptonite – what is ours? Adventures – what cool stories might we get involved in? Baddies – who and what might be dangerous to us? Me messing with the words may seem insignificant, but it altered our perspective, seeing ourselves as superheroes with an exciting job to do. It got us smiling and nattering away with plenty of good ideas. Creatives like designers and artists often use creative problem solving tools like mindmaps, doodling, and word games to look beyond the obvious solutions. Try asking each of your strategy team to do an audience sketchnote. First, they draw a person in the middle of the page who represents one of your key audiences – a customer, a potential client, an employee, a patient – whoever uses your services or buys your products. Now they have to put themselves in their shoes and draw and write all the things that person cares about, hates and enjoys. It’s a really useful exercise in empathy and seeing things in new ways. It will also help you later on, when you want to create content that appeals to that audience. And if your team find the exercise too hard, you need to do more research on your audience (i.e. talk to them!). So many strategies sit, gathering digital dust, on your intranet. Read by only those who wrote and approved them. But just like Sarah did with her Snakes and Ladders image, we can help colleagues and our audiences understand what we’re doing, by explaining the key points with images. Things like mission, values, and tone of voice can be much more easily understood by a colleagues and audiences if they are illustrated. This is your visual executive summary, so just communicate the main bits – so more people can join your mission. 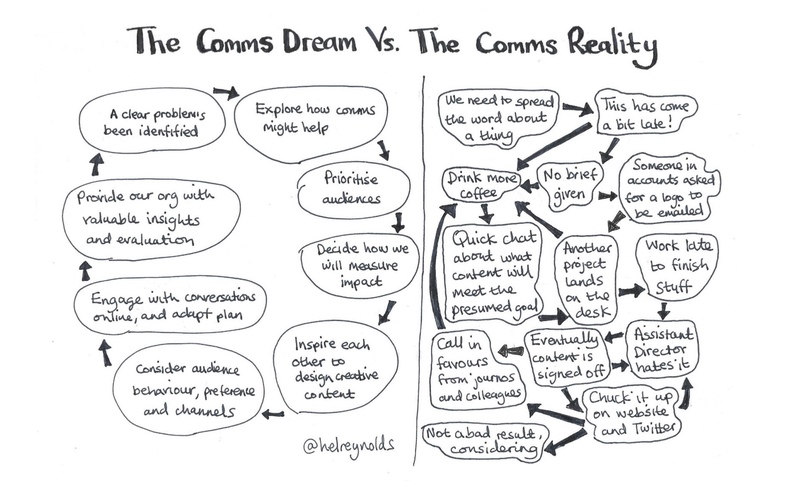 There we have it – designing your communications strategy doesn’t have to be stale and lack creativity! If you’d like help with designing your creative communications strategy or a social media strategy with real impact – give me a shout. You can book on my social media strategy workshop, or contact me for a bespoke session for your team. Would propose marriage this to blog post were such a thing possible. Useful, fun and immediately leading to action. Adorable.